So a while ago I saw a pin called “paper bag floors” on pinterest. It looked like someone had done something with their concrete slab that involved staining the concrete and I figured paper bags were involved in the application process somewhere. I didn’t click through b/c we don’t have a slab. A few months later, I was trying to clean Pebble’s bedroom and was just *DONE* with the carpet. I don’t think I have a before picture anymore, but I know I took one at some point. Besides potty training doing a number on his carpet, and trying to house break the most recent attempt at a family dog (as a FB friend said about herself recently, we are just not good dog parents), Pebble was in the habit of sneaking things into his room to play with or eat in the morning. An entire bottle of yellow craft paint (played with), chocolate chips (some eaten, the others played with and then left to melt into the carpet in the morning sun), rasins, cheerios, and other things I’m sure, littered his carpet. It literally COULD NOT be any worse. I was desperate. Something NEEDED to change in his room. The closest thing to a "before" picture I have. After about three hours, the first of two primer coats was up and we had a BIG mess! And, since necessity is the mother of invention, I remembered that paper bag floor pin. And googled it. And found that she had SUBFLOOR just like we do. I literally pulled his carpet up the same day. By the next day, the carpet was at the curb, the walls were in primer, and the the door and window casing had been demo’ed too. La Roca stated that from now on there is a waiting period between finding a project on pinterest and initiating it. Especially a big project like this. But he was as desperate as I was, so onward we went. It took about a month. I started this the weekend before a big few weeks for La Roca…he worked every day and night for two weeks straight and two weekends too. I did everything I could and had the room painted in two days, the carpet and pad pulled up and the carpet staples and tacks removed. He sanded the subfloor with a belt sander (ohmygosh, so messy!) and the next day I glued down the paper bags. It took almost four days to get the whole floor prepped and bagged and there was a line in the middle of it from me taking a 24 hour break in the middle of the room. We pressed on and stained the floor with a rust oleum oil based quick dry stain that dried to the touch in less than four hours. It looked GREAT. The next step was polyurethane. The advice from the blog I was following was 12 coats of water based poly. We managed to get six coats out of one gallon, which said it would take SEVEN DAYS to fully cure. The floor still looked great, but we wanted to keep it looking great, so I dutifully waited the seven days (secretly checking every day by putting my fingernail into the very edge of the poly to see if it had cured). To say I was worried when it was still flaking off with my fingernail on day five would be an understatement. I had a trip out of town so La Roca took over and resolved that he would make this work before I got back. Bless the man, he scraped all of the water based poly off, ended up repapering the entire floor, and had it stained when I got back. Turns out that the oil based stain is supposed to cure for 48 hours before you apply a water based product on top of it, so we used an oil based poly this time. Four hours between coats, four total coats, plus 24 hours to fully cure and we were DONE! 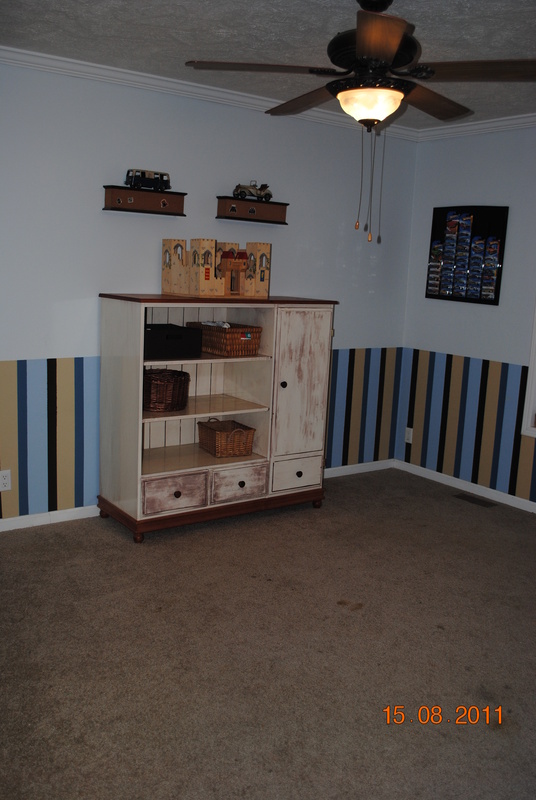 The trim got painted, and installed and we moved furniture back in. It all sounds so easy, but rest assured that over the course of four weeks of working on this, there were quite a few not easy points. 2. The first time I did exactly as she said, except used fast dry stain. The poly didn’t adhere. 3. The second time, La Roca used fast dry oil based stain (Rust Oleum Kona, if you want to know the color) and oil based floor poly in high gloss. It worked. 4. 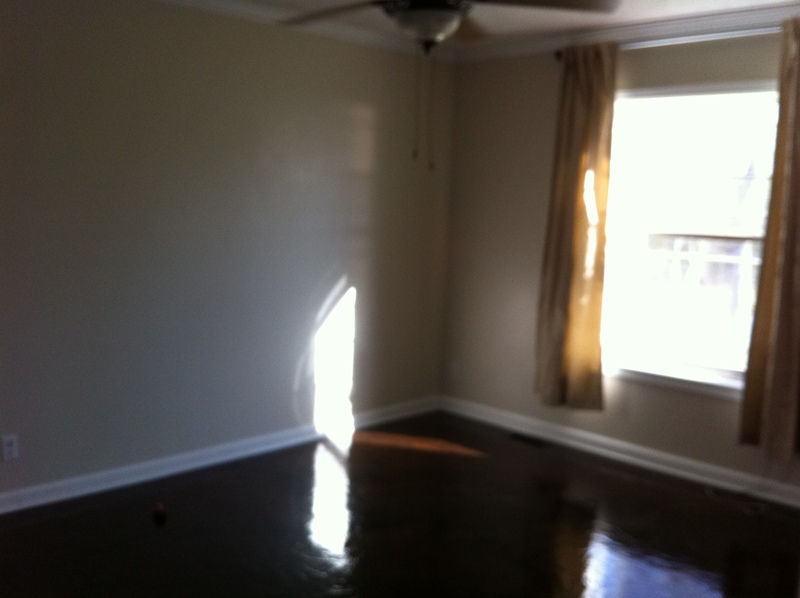 We replaced the trim and place a shoe molding right on top of the floor for a clean look. Having the trim removed while I painted was great, but it was also really key to getting a good stain without messing up the trim. 5. We LOVE the result. 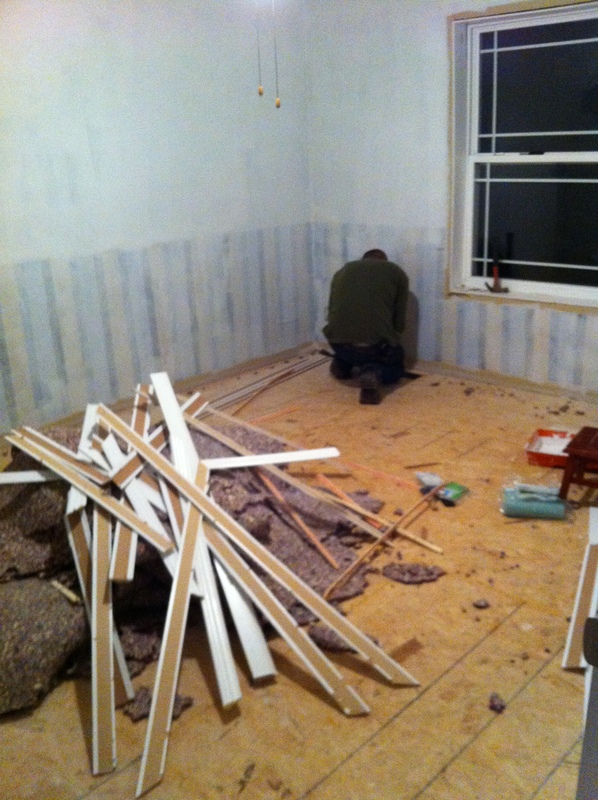 Without the mistakes, it cost about $0.51/sqft (with mistakes, about $1.00/ft because we used twice the materials). It looks GREAT, feels good under the feet and is just generally amazing and we plan to do our entire house with it, excepting the wet zones. 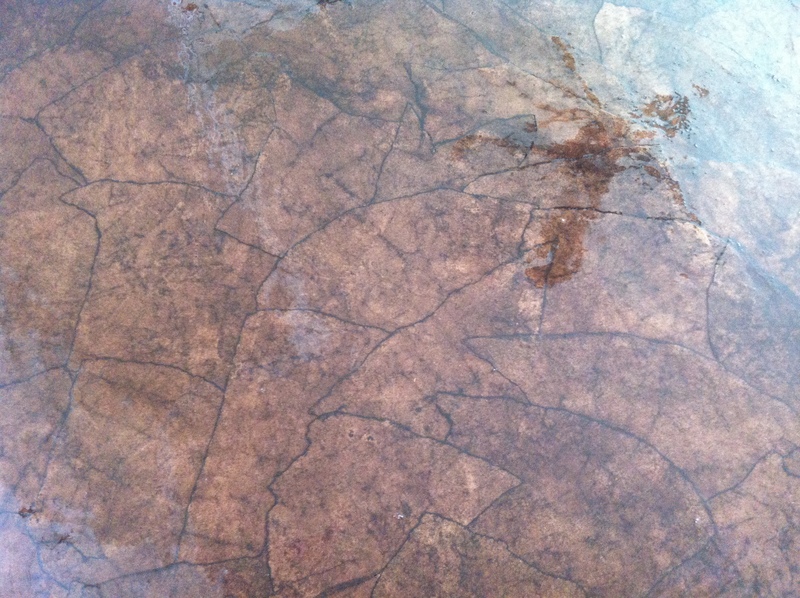 A close up of the finished floor. This 20-minute Cheesy Skillet Lasagna Recipe is simple to make on the stovetop. It has only three ingredients and you can make supper in one pot. *My family loves easy Italian food! This is perfect for a fast weeknight dinner. No bake Kit Kat Squares! There is a wafer cookie crust on the bottom, layered next with a chocolate and condensed milk, and topped with a kit kat crumbs. No baking required-- just the microwave and the refrigerator make these beauties!